Class DD/PL (Year 4) enjoyed the first Share session of the new school year. Activities were on a Harvest theme. The children, parents and grandparents made Chinese lanterns, masks, chalk patterns, poems and tortilla wraps. The whole of class DD/PL (Year 4) have been learning the clarinet thanks to the Wider Opportunities Scheme run by the County Music service. This is a great way for large numbers of children to try out an instrument. Watch this superb performance by the children of class GA / JB (Year 6). They performed this song as part of our Harvest Festival in St. Michael's church yesterday. Class NS have been composing a piece of Tudor style music on Friday mornings with our brilliant visiting music teacher - Mrs Rayner. The children played xylophones, clarinet, recorders, guitars, drums and keyboards. There is also singing and dancing. We have some new digital cameras in school which can take panoramic images. See these great pictures below taken by Mrs Spencer. Last week saw a new initiative called 'Meet the Teacher'. It was an opportunity for parents to see a series of presentations about each year group in the school. The teachers talked about expectations across the areas of the curriculum and outlined how parents could help their child progress in these key areas. Every Wednesday after school sees the HHH club meet up for some food, drink, art & craft, stories, singing and prayers. The club has become very popular with over 35 children and 5 adults (including 3 of our governors). This year we have started a brilliant new scheme. A whole class has the chance to learn an instrument. A teacher from the county service has provided an instrument for every member of class RV and has run a weekly lesson for them. Hopefully some of these children will be inspired to learn to play the instrument on a permanent basis. Watch this video below to see class RV in action - making a fantastic sound. We have been producing the weekly newsletter on a Monday for the past year. We are finding that new information comes up on a Monday, but we are unable to get it onto the letter to be copied and handed out to all children in time for the end of school. From next week the school newsletter will be given to the pupils on Tuesdays. The letter may be emailed / on the BLOG either by the end of Monday or on Tuesday morning. REMINDER – if you would like to receive your weekly newsletter by email please email us on admin@hitchams.suffolk.sch.uk. Thank you. Our services will take place on Thursday 29 September in St Michael’s church for Key Stage 1 at 9:30am, Key Stage 2 at 10:30am. Then on Friday 30 September at 9.30am for Foundation. Each child may bring in 1 or 2 small items to present for our Harvest collection. Orchestra will now start NEXT Tuesday (4 October) a letter will come out to Y3-6 with details and a form to complete this week. Recorders cannot start yet as we do not have enough teachers for this club. We will advise parents of when and where the club will commence as soon as we can. Thank you to all those families who attended our ‘Meet the Teacher’ afternoon. We hope that you found it informative and useful. All of us agree that the first session was not as successful as the 2nd or 3rd due to the huge number of young children attending – we are considering alternative arrangements for this meeting next year, but if you have any suggestions we would be grateful to hear from you. The Friends would like to advise parents that £220 has been received from Bags2School following the charity bag collection back in the summer term. The next collection date is Friday 13 January, which is ideal if you are having a clear-out after Christmas. Collection bags will be given out before the Christmas break. The Friends would like to thank Mr Brook for all his hard work in preparing the Quiz for their fundraising event last Friday, and also Mr Mulrenan and Mrs Hopkins for their help on the night. The event raised £175 and the Friends would like to thank all the families that came along to support the event and to attend the AGM. Maternity cover from 31 October 2011. We are seeking to appoint an enthusiastic teacher for a Year 5 class within this caring CEVAP School of 360 children in 13 classes. You will need a good knowledge of the KS2 curriculum, be able to demonstrate excellent classroom practice and to create a stimulating learning environment. In addition you should be passionate about children's learning, have high expectations and be supportive of the Christian ethos of the school. In return, we can offer you a pleasant working environment, well motivated children, supportive parents, excellent resources and team planning. Please find with this letter the Scholastic leaflets, please complete and return to the office with payment by Friday 23 September. PLEASE NOTE PAYMENT MUST BE EITHER BY CHEQUE PAYABLE TO SCHOLASTIC LIMITED OR BY CREDIT CARD. Please note that item 216 in the leaflet is now NO LONGER AVAILABLE. 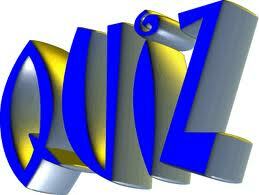 Just a reminder about the Friends family event this Friday; the Quiz night has been a great success in the past. Mr Brook is busy preparing an INTERACTIVE QUIZ, where teams, of up to 6, answer multiple choice questions on a variety of themes using Interactive Voting (like in 'Who Wants to be a Millionaire'). This year there will be additional questions the younger team members. This really is a family event, and last time we had 21 teams take part. There is a licensed bar, tuck shop & soft drinks. Tickets are £2 per player. Our services will take place on Thursday 29 September in St Michael’s church for Key Stage 1 at 9:30am and Key Stage 2 at 10:30am. Then on Friday 30 September at 9.30am for Foundation. The services will include our usual harvest singing and prayers. These are Thanksgiving services in which classes have chosen items such as poems or songs to be presented by some of the children. All parents are welcome to attend. Each child may bring in 1 or 2 small items to present for our Harvest collection. Please no glass jars or bottles as the pupils have to carry them to church. Any food donations will be passed on to the West Villa Homeless Families Unit in Ipswich and any money raised will go to the Soup Kitchen in Ipswich. 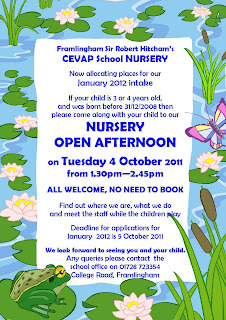 We will be allocating Nursery places for January 2012 intake in October. If you have a child born BEFORE 31 December 2008, you will need to submit an application form to the school office if you wish your child to be considered in this round of allocations, forms must be returned by 5 October at the latest. Please ask at the school office for a Nursery brochure & application form. 4 October from 1.30pm – 3pm (amended date). Parents are welcome to pop in on this date to look around. Parents of Year 6 will have received a letter from SCC regarding High School Applications. Please be aware that applications should be made on-line or using the form which should be returned to the address on the letter BY MONDAY 31 OCTOBER AT THE LATEST. CAN YOU HELP US KEEP OUR CHILDREN SAFE? Despite widely advertising there have been no applications for the position of Crossing Patrol Officer. We have been fortunate to receive funding for this post from our local Councillor, Councillor Colin Hart. We have been actively seeking to recruit someone for this post since July – is there a parent, grandparent, relative or friend who would be interested in this job? It entails a total of 6 ½ hours per week, to cover mornings and afternoons. The rate of pay is £6.47ph, with a half pay retainer during the holidays – we even supply a uniform! Job share will be considered. Please contact Mrs Hulley at the school office for details. The Friends wish to advise parents that we have a delay with the smaller sizes of polo shirts, we are finding a short term substitute, but the earliest this will be available will be 3 weeks. Mrs Walker will contact parents who have already handed in an order. The recent flyer for the Belles on Bikes event has suggested that some of the money raised will go towards 'The Mills Charity Community Centre Project Fund’. However, a Mills Charity Community Centre Project Fund does not exist and unfortunately this flyer was produced without permission from The Mills Charity. The morning lining up routine is working very well. The children’s readiness for learning has improved as they settle really quickly into their morning tasks. Even in a short space of time the staff have seen an improvement in the children’s independence in their morning routines. Could we ask that Reception parents wait until the children have entered the building before leaving the fenced off area, as we have noticed a bottle-neck occurring at the lower school doors – thank you. As part of the SCC ‘Wider Opportunities’ scheme we are receiving a delivery of clarinets for classes PL/DD and EM and brass instruments (Cornets, Tenor Horns & Baritone Horns) for class RV. Over this year the children will receive whole class music lessons on a Friday with teachers from the County Music Service. After a few weeks the children will be able to take the instruments home on loan to practice. Parents will be required to complete a loan agreement form and return it to the office before your child takes the instrument. These forms will be sent out on Friday. Please can we ask parents to be considerate when parking to drop off and pick up and to not park in front of local residents drives, garage or businesses. Thank you. A really fun evening for all the family. This year there will be special questions for smaller children. Yesterday afternoon saw a new group of children start their cycling proficiency course. We are very grateful to Mr Byer, Mr Mulrenhan and Mr Stanbrook for giving up their free time to run this important course for our children. The first session covered important safety and cycle care issues. They also started to look at the basics of safe cycling. Our school mascot (PRICKLES) went camping last weekend with some SRH families in Rendlesham Forest in Suffolk. It is a lovely campsite - perfect for families. Follow this link to find out more FOREST CAMPING. Tamzin (in year 6) brought in this huge wasps nest. It was found in the loft a a house her Dad was working on. The close up photo below shows a small part of this incredible structure. The perfect hexagons fit together beautifully to form a strong bond. Wasps lay their eggs in each of the hexagons. The whole nest is made from very thin strips of wood which the wasps get from trees, fences or sheds around our houses or gardens. It really shows the wonder of nature and that wasps must be brilliant at maths! There is a growing number of our children and ex-pupils who belong to a great local sports club. A group of them recently visited the athlectics club in Ipswich. Framlingham Flyers is a small running club with keen and friendly members who all share the love for running. We meet regularly throughout the week, Monday being our structured training session, Wednesday our tempo running session and at the weekends we enjoy long runs into the countryside. Based in Framlingham, Suffolk the club has regularly entered teams for local races and even have individuals running international events, anything from 5k to Marathons. So please come along and join us. New members are always welcome. To visit the club website follow this link: FRAM FLYERS. so please remember to bring instruments / PE kits on the correct days. This new initiative invites you to attend a presentation by your class and key stage teachers to understand a little more about what your child/ren will be experiencing this term in their new class. The meeting will be no more than 20 minutes, and is not an opportunity for individual chats with your teacher, but will give an overview of your child/rens areas of learning including suggestions for helping at home. You may bring your children with you if you wish. KS1 and KS2 enjoyed a lovely Church Service on Friday when Revd Graham Owen welcomed the children back for the new school year. He also touched on our 2 main themes this year: “Challenge for All” and “Independence – Ready for the Future”. Throughout this year there will be opportunities for you to be involved in our 2 themes – Revd Owen was very keen to emphasise that children must never be worried to ask for help and must always strive to do their best. We are pleased that further ‘Activities for All’ funding has been made available to the school this year. The fund, part of a Government initiative, helps support children and young people to attend more activities that take place outside of normal school hours by contributing to activity costs, focusing on those children who are disadvantaged by economic circumstances. The fund can also be used to provide opportunities for children who are young carers, for those who do not have English as their first language or who are experiencing challenging times in their lives. If you feel that you would like your child to be considered for this funding, please get a form from the school office and return by Friday 23 September. Our allocated amount may not be enough to meet all requests, but all applications will be considered when allocating the fund. Please can we inform parents that ALL gates will be closed between 9am and 3pm, if you come into school between these times (eg as a volunteer, or to collect from Nursery) PLEASE ENSURE THAT YOU SECURELY CLOSE THE GATE BEHIND YOU. We still have spaces for Wednesday Guitar lessons (Y3-6), if your child is interested, please contact the office by NEXT Wednesday at the latest. Reception Applications Letters and Forms for next year are now available at the school office. Please note they MUST be returned to the Admissions Team at Ipswich by 13 January 2011. For information go to: www.suffolk.gov.uk/admissionstoschools, you can apply online at www.suffolk.gov.uk/onlineadmissions, but you will still need to get a Supplementary Information Form (SIF) from the office. We are now collecting these vouchers, please pop in box by the office until 30 October. Due to a clash with cycle proficiency the share session on Thursday 20 October will now be on Friday 21 October… letter to follow. The Framlingham churches invite you to a week of continuous prayer at St Michael’s Church, please see the parent notice board, or church notice board for more information. As KS2 are studying the Tudors this term, we felt it would be useful for parents to know there is a weekend of re-creation of Tudor life from 1553 at Kentwell on Saturday 24th and Sunday 25th September, 11am – 5pm. Please see their website www.kentwell.co.uk for details, there is a slight reduction in costs if you apply on line in advance. This is the first ladies only charity bike ride in Suffolk with a 17 mile ride starting at the Castle Inn Framlingham. There is a £5 entry fee, part of which will go to Radio Castle, a new community radio station. Cyclists can then raise money by sponsorship for any charity they wish. See www.bellesonbikes.co.uk or contact Rupert Durrant on 07993 815533 or rupert@thedurrants.com to secure your entry. VOLUNTEER HELPERS IN CLASS… CAN YOU OFFER SOME TIME? Thank you to all the volunteer helpers who have already registered with us this year. Some classes have had no parent volunteers yet, so we have a number of sessions where help is required. Below are the days/times where your help would be appreciated. Volunteer help is a very important part of school life and if you feel able to help at any time, not just with any of the sessions below, we would be very pleased to hear from you. To help in school you do need to complete a Volunteer Declaration form and CRB form so we can run the relevant checks. If you have not previously completed one, or wish to check if your name is already on the list, please contact the school office. If you are able to cover one of the sessions below please speak to the class teacher. Welcome Back to everyone for a new school year. A special welcome also to all our new starters in Nursery, Reception and further up the school. Along with this letter of general information please also find a Diary Dates leaflet which gives details of dates for this term and beyond. From Monday 12 September school will be unlocked at 8.30am to allow for children to take their bags to the cloakrooms. At 8.45am (on the ring of the bell) all children and parents will be asked to exit the school to allow for the children to meet their teachers who will be waiting for them on the playground. The teachers will organise their class line and each class will walk in to school prepared and ready for learning. We would ask that parents do not stand with their children in their lines but allow them to independently line up with their peers. Reception children should line up within the fenced area just outside their class door. After school ALL class teachers will bring their classes onto the playground to meet their families. Any children not collected will then return to their class teacher who will take them to the front office. We would ask that if you are meeting your child you stand away from the walkways to allow for the school to empty as swiftly as possible. If you allow your child to walk home we require you to sign the attached slip and return it to the office please, else we will be unable to let your child leave school. Please advise the class teacher of any changes to collection arrangements in writing. Please can we remind all parents that dinner money needs to be brought in on a MONDAY for the week. If you do not pay on a Monday, you will need to provide a packed lunch for your child that week. Payments can also be made half termly, ‘pre-pay’ forms will be sent to those who normally pay this way – if you would like to start paying half termly, please pop into the office to get a form. Thank you. apart from school lunches (paid to Suffolk County Council (SCC)) and photos. Please can we also stress the need for the CHILD’S NAME and CLASS to be written on the reverse, thank you. The school’s policy regarding absence requests for holidays is that they should be taken during school breaks NOT during term time. Applications to take your child out of school during term time will be considered for exceptional circumstances only. Authorisation may be given only at the discretion of the Head teacher. Applications will not be considered unless they are received at least THREE WEEKS prior on a Leave of Absence form with a full written explanation as to why you are asking for absence during term time. WE WOULD REALLY LIKE TO INCREASE THE TAKE UP OF THIS. Many parents now receive their school letters by email; if you would like to register please email us on admin@hitchams.suffolk.sch.uk. We are endeavouring not to produce a ‘hard’ copy to those households that receive letters by email, so please ensure your child is aware they do not need to receive a paper copy. Those who are already registered do not need to re-register. ARE YOU A MUSICAL PARENT? …we need your help…. With Mrs Armstrong and Miss Ashberry taking on the new school Orchestra that we hope to get up and running later this month, it means we are short of teachers for the Thursday afterschool Recorder club (3.05-4.00pm). If you are a musician who is willing to teach one of our recorder groups we would love to hear from you. Please speak to Mrs Armstrong or Miss Ashberry directly, as soon as possible. Thank you. We still have spaces available in our School Nursery this term. 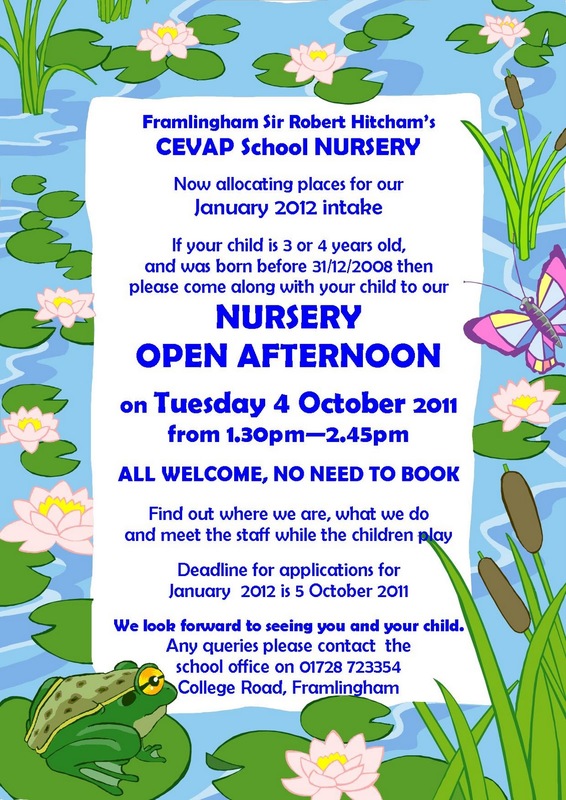 If you have a child born BEFORE 31 August 2008, or have friends with children of this age, do please come to the school office to get a Nursery brochure, application form and arrange a time to look around the Nursery. We are planning 2 church services on Friday for KS1 & Foundation at 9.30am and KS2 at 10.30am, if you are able to offer help walking the children to & from St Michael’s Church, please speak directly to your child’s class teacher by Thursday. Thank you. is/are allowed to walk home from school on their own. We have 3 children at school who are extremely sensitive and allergic to NUTS. EVEN IF THEY ARE TOUCHED BY SOMEONE WHO HAS HANDLED NUTS OR PRODUCTS CONTAINING TRACES OF NUTS it could bring on anaphylactic shock which can be life threatening. Similarly, if you bring snacks to the playground at the end of the day for children to eat before going home please can I ask that you are VERY CAREFUL that they do not contain nuts or traces of nuts and that leftovers are not abandoned on the playground. We cannot stress how important this is. Your help and co-operation is much appreciated. During the school holidays both playgrounds have been finished off with new markings. There are netball courts and various patterns to explore. We also have a brand new school hall floor. On a fabulous day in the school holidays Miss Hitchcock became Mrs Armstrong in a service attended by over 400 people at the Colchester Road Baptist Church in Ipswich. Lots of smartly dressed staff from Robert Hitchams were there to celebrate the occasion.